Logic is now widely recognized as one of the foundational disciplines of computing and has applications in virtually all aspects of the subject, from software engineering and hardware to programming languages and artificial intelligence. The Handbook of Logic in Artificial Intelligence and its companion The Handbook of Logic in Computer Science were created in response to the growing need for an in-depth survey of these applications. This handbook comprises five volumes, each an in-depth overview of one of the major topics in this area. The result of years of cooperative effort by internationally renowned researchers, it will be the standard reference work in AI for years to come. 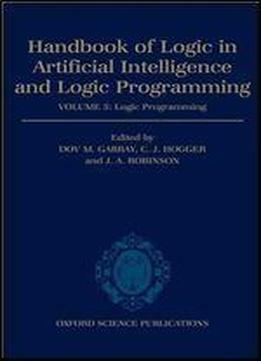 Volume 5 focuses on logic programming. The chapters, which in many cases are of monograph length and scope, emphasize possible unifying themes.